Rise with the sun and gaze out into the beautiful Florida waters from your private balcony at Villa Nova condominium building in Highland Beach. Villa Nova Highland Beach is an intimate yet luxurious waterfront community with just 24 sophisticated condos standing 15 stories tall on the sand between the Atlantic Ocean and Intracoastal Waterway. In the Southern part of Palm Beach County, Villa Nova real estate is home to residents looking to live a glamorous life in paradise. Tropical landscaping, and lush greenery can also be seen for miles from every upgraded Villa Nova condo. Some of the upgrades in the condos for sale in Villa Nova include spacious open floor plans, large master bedrooms, granite countertops in oversized kitchens, walk-in closets, crown molding, wood flooring, and wrap around windows. Villa Nova Highland Beach provides residents with many options of 5-star amenities. Residents have access to a gorgeous private beach with private cabanas, or they can relax on the lounge chairs by the swimming pool. The resort-style amenities in this Highland Beach community also include a fitness center, boardwalk, outdoor area for picnics, sauna, community room for entertaining, and storage room. 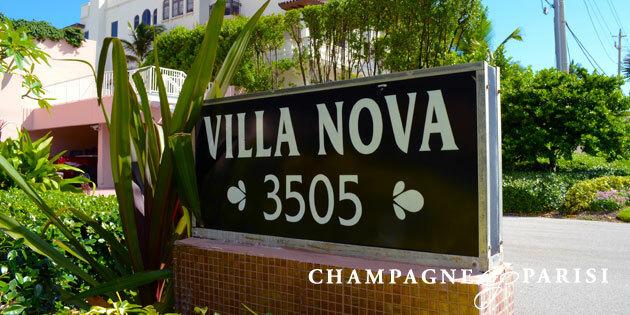 Residents are secure inside Villa Nova with 24 hour security, as well as shutters and a generator for hurricane season. Living at Villa Nova, you’ll always have something to do. This condo community is located in between two major cities within a short distance to many local shops, fine dining, entertainment, and cultural exhibits. You’ll also be near major highways and two international airports.